The delivery of aid has become the epicenter of a confrontation between President Nicolás Maduro of Venezuela and the country’s opposition. People with medical needs say the political theater is eclipsing their needs — with dire consequences. 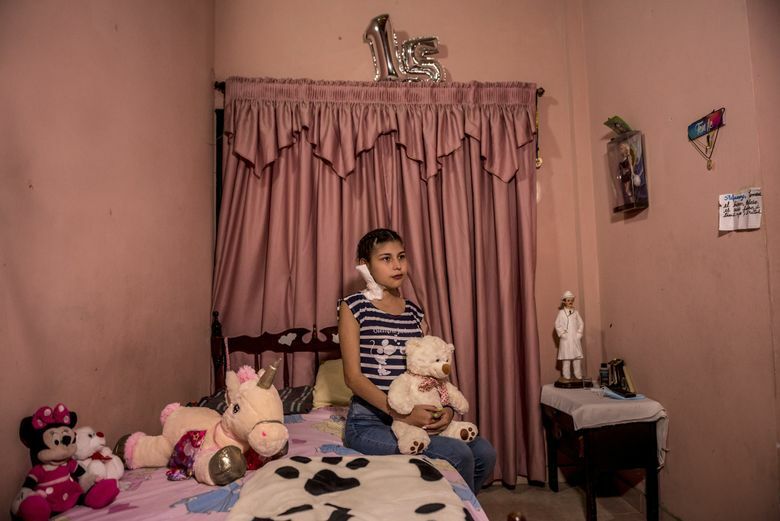 SAN CRISTÓBAL, Venezuela — One moment, the Casique family was piled on a motorcycle, on the way to school: the mother, a son and Nora, the 8-year-old daughter. A fraction of a second later, a truck had barreled into them. The accident landed the family in the hospital — and condemned the father, Israel Casique, to scour pharmacies and the black market, or travel to Colombia, in an endless search for the medications and supplies they need to survive in a country where the health-care system is in collapse and hospitals lack even basics like soap and alcohol. 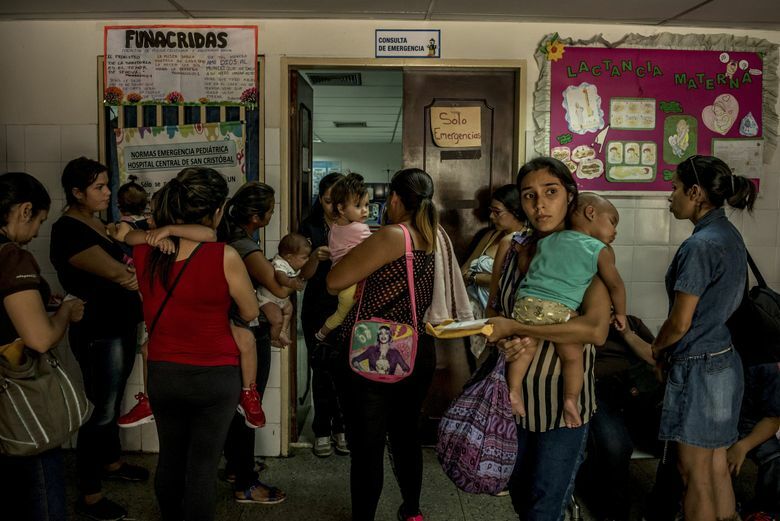 The arrival of American donations of food and medical supplies to the Colombian border with Venezuela appeared to be a lifeline for the family and dozens of other patients in critical condition or with serious chronic diseases interviewed by The New York Times last week. But the delivery of aid has become the epicenter of an escalating political confrontation between President Nicolás Maduro of Venezuela and the country’s opposition, and the impasse has kept the supplies stuck in a converted customs warehouse in the Colombian border town of Cúcuta — and out of Venezuela — for nearly two weeks. 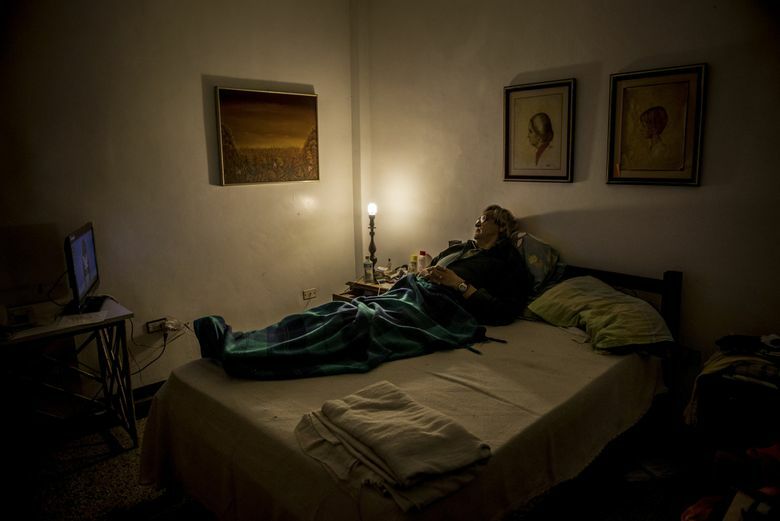 Venezuela’s chronic patients say the political theater is eclipsing their needs — with dire consequences. 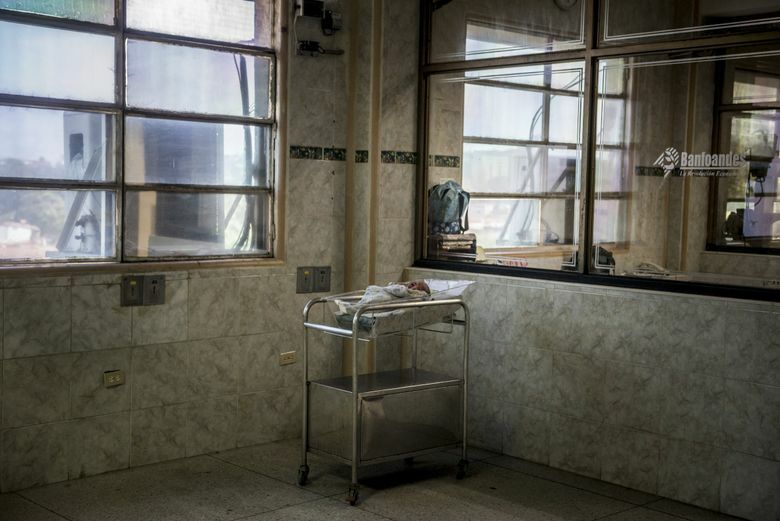 In the pediatric wing of San Cristóbal’s Central Hospital, desperate mothers roam the corridors with lists of out-of-stock medicines needed for their children’s surgeries. Others sit in helpless torpor by the intensive care ward, where their babies struggle on life support against preventable bacterial diseases. 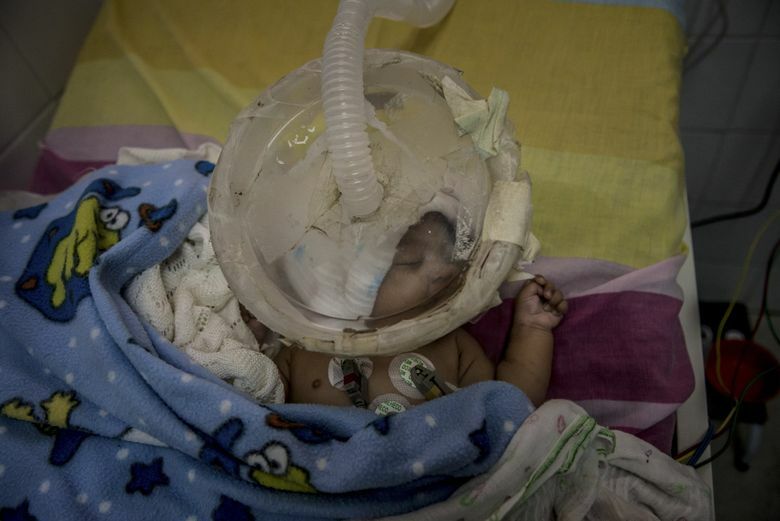 Irianny Baute Marin, a diminutive 2-month-old baby with bronchitis, gets respiratory treatment from a device patched together with tape. Her parents had to dispatch someone to Colombia to get the antibiotics she needs, because they are not available in Venezuela. Many other families with no access to hard currency to buy imported supplies see the humanitarian aid as their last chance to save their children. Maduro has denied there is a humanitarian crisis in Venezuela and said Monday the country can export medication. He called American aid a “Trojan horse” aimed at overthrowing his government and blocked a bridge between Venezuela and Cúcuta with barricades and soldiers. On the other side of the bridge, Venezuelan opposition leaders, along with their Colombian hosts, have described the delivery of the aid as part of a plan to oust Maduro. They hope to break Maduro’s hold on medication and food — one of the tools he has used to ensure loyalty. They also hope that the Venezuelan military, a key pillar of support for Maduro, will turn against him if forced to stand between the population and lifesaving supplies. Juan Guaidó, a leader of the opposition who has been recognized by the United States and around 50 other countries as Venezuela’s interim president, has vowed to get the convoys through and has traveled to the border himself. Top Latin pop stars, including Maluma and Juanez, will perform at a hastily organized Venezuela Aid Live concert in Cúcuta on Friday. The Venezuelan government will stage its own countershow across the border. As the political theater on the border escalates, some opposition leaders admit not enough is being done to ensure the supplies get through and reach the right people. 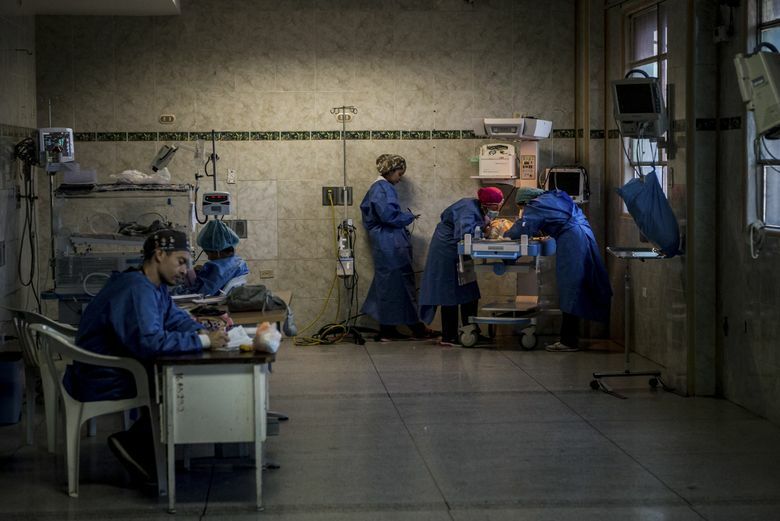 “The challenge is to keep the human needs in sight while this political battle unfolds,” said Feliciano Reyes, director of Acción Solidaria, a Venezuelan nonprofit that imports small quantities of donated medicines and distributes them directly to patients and doctors. On Saturday, Feb. 17, a San Cristóbal education official, Aurelio Galán, undertook an exhausting journey over winding mountain roads in triple-digit heat to Cúcuta to join a rally demanding the release of medical supplies. 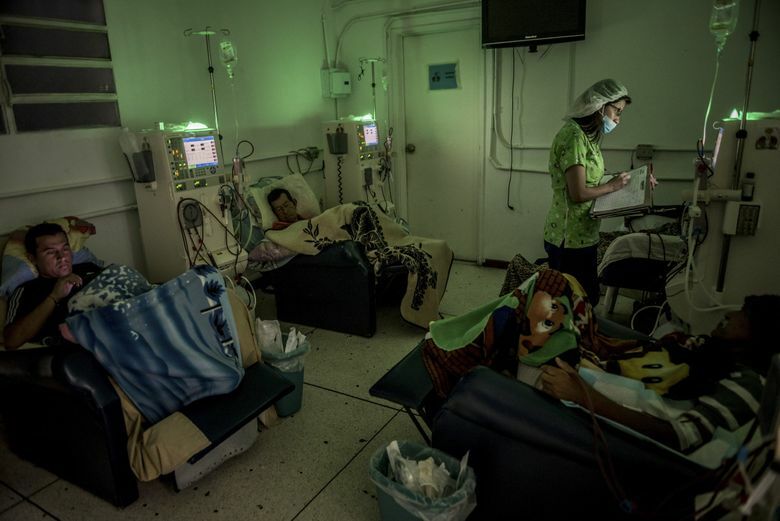 His wife, Luz Marina, stood by his side clutching multiple plastic bags of dialysis solution, which she has had to buy in Colombia since their state-run clinic stopped providing them a month ago. A week’s supply equals her husband’s entire monthly salary. He won’t be able to buy them for much longer, he said. Like many other dialysis patients and their families, the Galáns heard on social media and local television that the aid containers in Cúcuta have materials for dialysis, as well as medication for hypertension and diabetes, which many kidney patients also need. 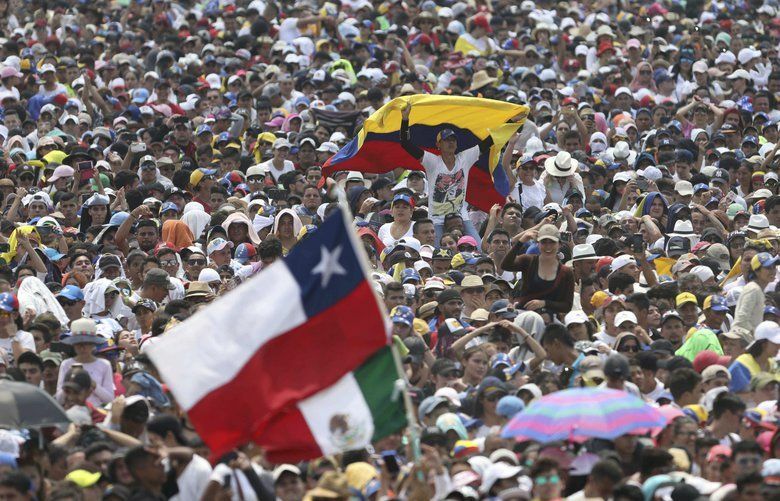 At the Cúcuta rally, opposition speakers amplified the expectations. 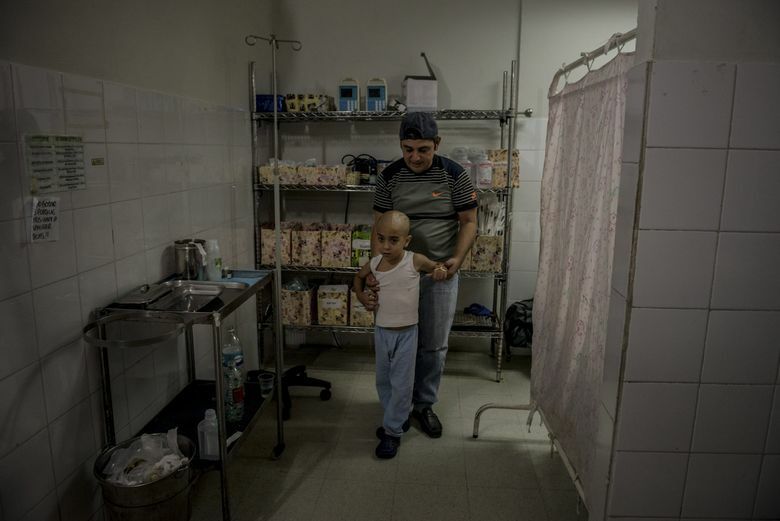 “We’re going to bring to Venezuela the medication, the medical materials, and to bring liberty,” said Gonzalo Ruiz, a Venezuelan doctor and an organizer at Aid and Freedom Venezuela, an activist group. The Cúcuta aid depot painted a different picture. Since Feb. 7, the U.S. Agency for International Development has delivered about 190 tons of aid to Cúcuta. The vast majority of it is food. 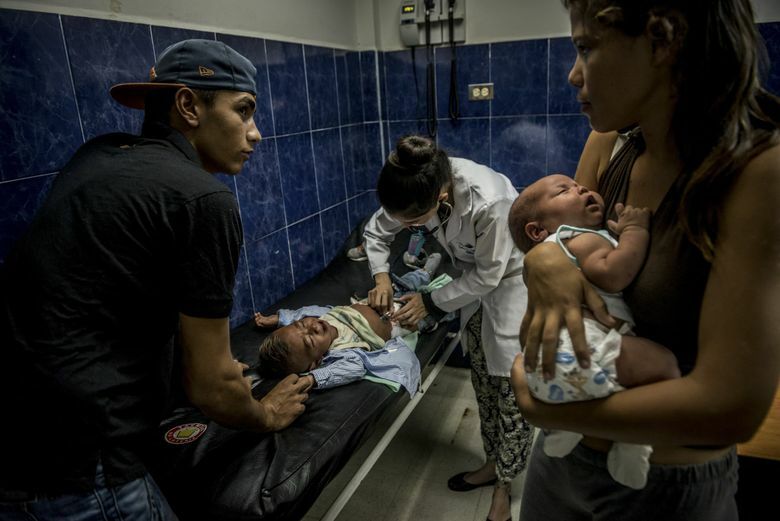 The amount of medication is too small to make a significant impact, said Manuel Olivares, an opposition leader in charge of organizing medical aid. No dialysis kits are expected to arrive in the near future. “We can’t pretend that this will solve all the problems at once,” he said. 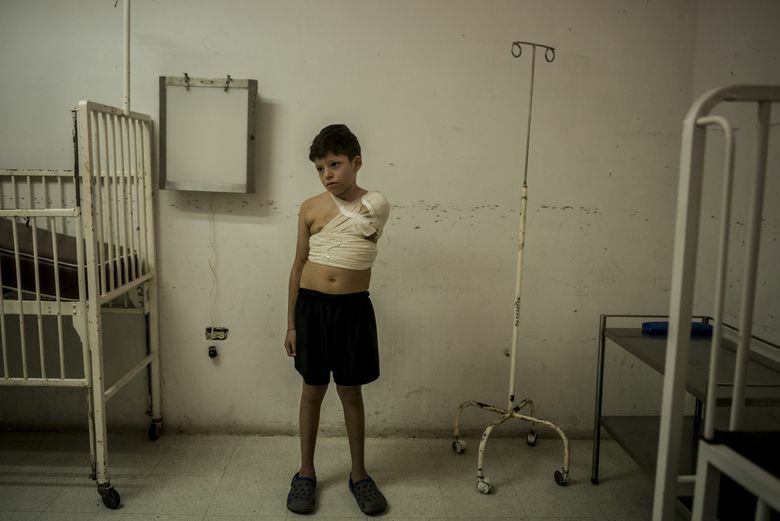 International relief organizations like the Red Cross, as well as dozens of small health-care groups working in Venezuela, fear the growing political standoff will jeopardize their low-profile work in the country. But on Thursday, Caritas, a Roman Catholic aid group, said it would support the opposition’s efforts to bring aid into Venezuela. 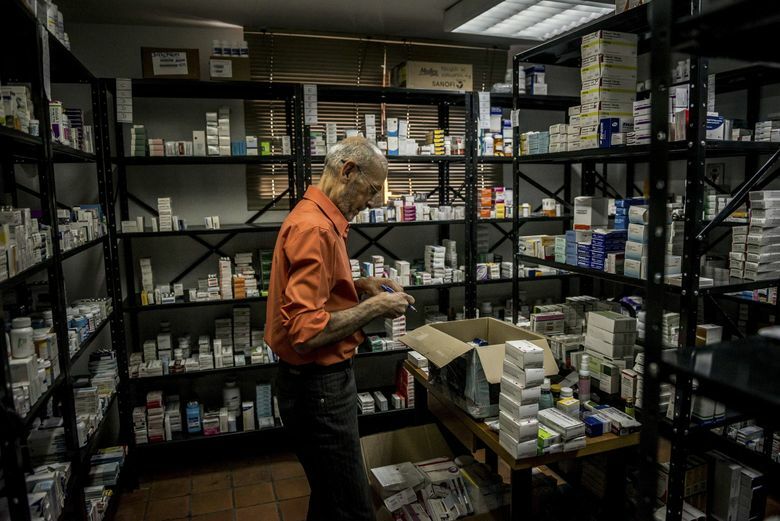 On Friday, the police raided and seized medication from Fundación Mavid, a small NGO that has distributed HIV medication in the Venezuelan city of Valencia for years. 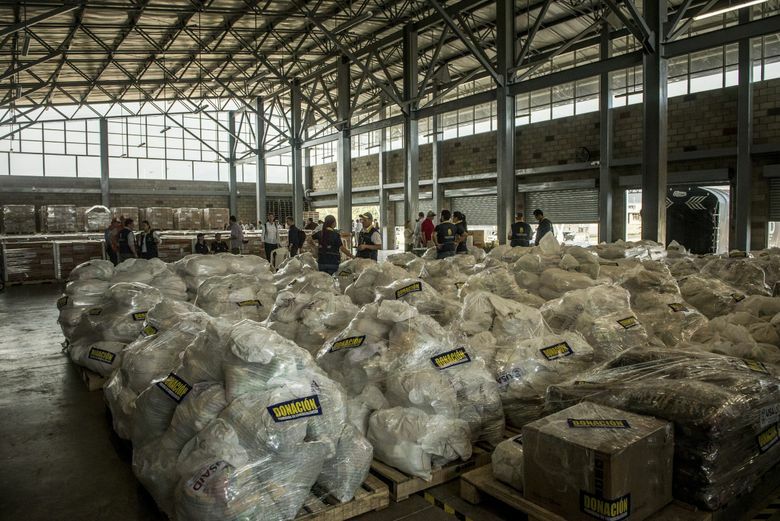 Critics of the opposition have asked why they and their Colombian allies have not distributed the stored aid to the thousands of struggling Venezuelans who have sought refuge in Cúcuta, or allowed Venezuelans to cross into Colombia to get the aid themselves. Some relief workers worry that the opposition’s desire to topple Maduro is overtaking humanitarian needs. Yet Saavedra, like a majority of Venezuelans in the region and the chronic patients interviewed by The Times, laid much of the blame for the aid blockade on Maduro. By denying a crisis, he is condemning thousands to death, many said. 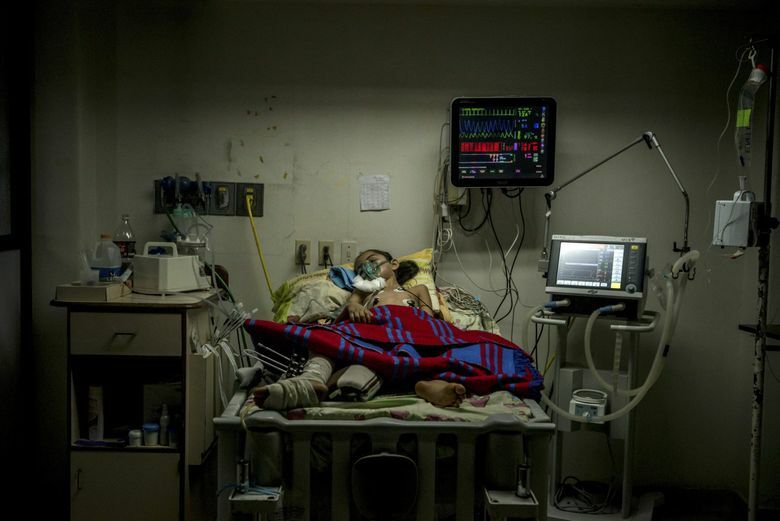 During a dialysis session this month, a 17-year-old kidney patient, Steffany Villamizar, sat up with a tube in her neck, surrounded by dying, bloated patients, and watched as the president toured a pharmaceutical plant on state television, laughing with his ministers.